This post was originally produced by the Passive House Group at Steven Winter Associates (SWA). Read more on the SWA Blog. 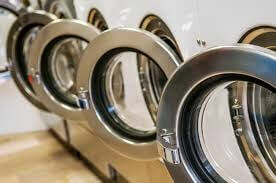 Common laundry rooms are typically provided in market rate and affordable multifamily buildings. Because there are no ventless clothes dryers available for commercial use in North America (such as condensing or heat pump dryers), Passive House (PH) projects must make do with standard coin-operated, conventional vented clothes dryers. With a conventional electric or gas vented dryer, ambient air from the laundry room is heated and blown into the dryer’s drum as it tumbles. This air picks up the moisture from the laundry and is exhausted – sending hot moist air and lint particles to the outside. For any dryer that exhausts more than 200 cfm and in common laundries that have several dryers, make-up air must be supplied to the room so the dryers have enough air to operate properly. This make-up air must then be heated or cooled and therefore, increases the building’s energy demand. Another complication with common laundries results from the fact that continuous exhaust is required for any common dryer exhaust riser. According to the 2014 New York City Mechanical Code, additional exhaust fans must be installed when ducts from individual dryers are ganged together in a common riser. These exhaust fans can ramp up and down to match the additional exhaust flows of one or more dryers as they operate, but they can not turn off completely. The increase in energy consumption due to these exhaust systems definitely has an impact in PH buildings where every last Btu counts. Let’s examine the energy demand of a common laundry in a 3-story, multifamily residential building seeking PH Certification that has 52 apartments, 105 occupants and a treated floor area of 39,000 ft2. The PHPP assumes 57 loads per year per occupant. If we assume that each drying cycles takes 45 mintues, that would equate to one dryer running for 12 hours per day for the entire year. For this example, we will assume the commercial dryers have exhaust rates of 200 cfm. When dryers aren’t running, the exhaust fan will ramp down to 70 cfm. Under these conditions and assumptions, the vented dryers increase the annual heating demand by 3%. For the sake of argument, it was assumed that the ERV and the dryer exhaust had similar fan energy performance of 0.5 W/cfm. So, “why not use ventless dryers in each apartment” you ask? This is a solution to the problem for sure, but there are many reasons this is not feasible for many projects: cost, space constraints, added maintenance, did I say cost? In the meantime, we take the hit on the energy demand, and we look forward to seeing commercial condensing or heat pump clothes dryers enter the market someday soon. Obviously a ton of assumptions were made to start this discussion. Mostly they are based on assumptions from the PHPP. This is one area where we are lacking in field data at the moment and are running on best judgement. If you disagree with this analysis, we are all ears and welcome differing opinions and analysis. This entry was posted in Regional Feature and tagged Laundry Rooms, Passive House, Steven Winter Associates.